Five conservative Latin American heads of state said in a joint declaration Monday that the votes by two US states to legalize marijuana would have important ramifications on regional efforts to suppress the drug trade. While the declaration did not say the leaders were considering relaxing their efforts against marijuana, it suggested that the votes in Colorado and Washington could make their enforcement of laws against marijuana more difficult. 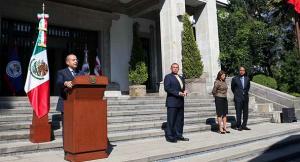 Outgoing Mexican President Felipe Calderon was joined by Honduran President Porfirio Lobo, Costa Rican President Laura Chinchilla and Prime Minister Dean Barrow of Belize in Mexico City for a meeting before issuing the declaration. Guatemalan President Oscar Perez Molina, who also signed the declaration, was not present at the meeting because he was overseeing recovery efforts from last Wednesday's deadly earthquake there. Mexico and Central America have in recent years seen unprecedented levels of prohibition-related violence, with more than 60,000 killed in Mexico during Calderon's tenure and with rising levels of violence in Central America as Mexican enforcement efforts push the so-called cartels into the isthmus. 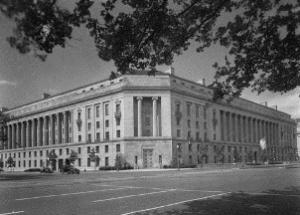 In addition to several paragraphs of boilerplate language reiterating their country's continuing commitment to fighting criminal drug trafficking organizations, the declaration also "underlines that it is necessary to deeply analyze the social, political, and public health implications for our nations of the processes in action at the state and local level of some countries of our continent to permit the production, consumption, and legal distribution of marijuana, which constitutes a paradigmatic change in respect to the current international regime on the part of such entities." The declaration asks the secretary general of the Organization of American States, who was mandated at the Summit of the Americas in April with completing a hemispheric study of drugs, "to incorporate an analysis of the impact of the new policies referred to [above] on our countries." It also calls on the UN General Assembly to hold a special session on drug policy no later than 2015. 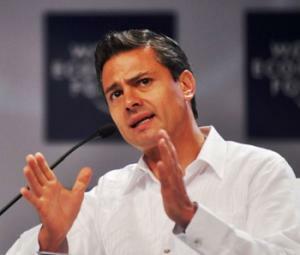 The Mexico City declaration comes just days after a key advisor to incoming Mexican President Enrique Pena Nieto questioned how Mexico will enforce marijuana prohibition there when it is legal in some US states. The Obama administration has yet to formally respond to the decision by voters in Colorado and Washington to legalize marijuana. Last Tuesday's legalization votes are reverberating not just across the country, but across the hemisphere. Investors pumped money into the sector after Colorado and Washington legalized cannabis for recreational use and Massachusetts passed medical marijuana legislation. In some cases, MMJ-related stocks hit new highs and saw record trading activity, with millions of shares changing hands vs. tens of thousands on a typical day. That’s particularly impressive given that the overall stock market plunged after the election. The Daily notes the stocks have dropped somewhat since then, and that not every cannabis business saw its stocks rise with the election. Nevertheless, "the increased investor interest in cannabis bodes well for the future of the industry," they write, "which could grow by leaps and bounds over the next year." 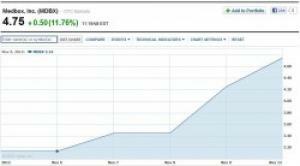 Are the buyers who drove stock prices up last week right to be optimistic? Looking at the market to predict the future of drug policy is kind of like using Intrade to predict a presidential election -- only time will tell at this point. But investors are doubtless thinking about a lot of the same things that we are right now: Will the passage of initiatives to legalize marijuana create political pressure on federal officials to ease up on the medical marijuana industry, or on Congress? How will the feds respond to the legalization votes? They must also wonder, if legalization systems do get established in these states, how will that affect the people (many of them our friends) who've risked much to build a medical marijuana industry serving patients there -- will they be winners or losers in that new business environment? In the long run, I believe the answer to the first question at least is "yes" -- states enacting marijuana legalization will ultimately put pressure on all the branches of government to do something to accommodate it, while giving an advantage to our allies in government in their efforts to change things. More states will certainly do this, given where public opinion seems headed -- the questions for investors in marijuana are how long that will take, and whether their businesses will survive until then. For advocates, the question is how many lives will be needlessly ruined (again, many of them of our friends) by prohibition in the meanwhile. "I really don't know what we're going to do," said one high-ranking law enforcement official involved in the decision who was not authorized to speak publicly. The most likely outcome will be that the Justice Department will prevent the laws from going into effect by announcing that federal law preempts the state initiatives, which would make marijuana legal for recreational use, law enforcement sources said. Perhaps it's just a typo, and I don't know what the sources told Mr. Horwitz, but no matter what the legal and practical outcome of all of this, it is not the case that DOJ can preempt a state's law by making an announcement about. They can ask a court to preempt the laws, and then the court will decide. Significant legal precedent indicates that Congress cannot force states to criminalize conduct they don't want to criminalize, anymore more than states can force Congress to lift such criminalization -- as I've pointed out, in 16 years of state medical marijuana laws, no federal prosecutor has ever tried to do so. Maybe they'll try now, and if so we'll see what the Supreme Court's inconsistent conservatives say and what the liberals say. But they've had plenty of incentive to go that route already, and for some reason haven't. Not that the feds can't make a fight of things. As the medical marijuana battles show, they have ways to interfere. They can send vaguely threatening letters, implying without directly stating that state employees would be violating federal law by implementing regulations for marijuana, as US Attorneys in most medical marijuana jurisdictions have done. 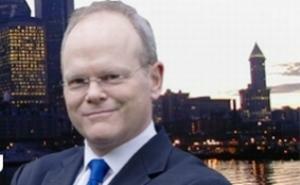 That could scare the governors, who could seek delays implementing the initiatives, which in turn would have to be addressed in court. The IRS could move against the new businesses, auditing and penalizing them under a tax rule that disallows most expense deductions for illegal enterprises. (The law bizarrely allows dispensaries to deduct the cost of marijuana itself, but not other things like payroll or rent.) They can make it hard for marijuana businesses to maintain relationships with banks. And of course they can raid any marijuana store that they choose to. But none of that is the same as preempting the laws themselves. And none of it would stop people from possession marijuana whenever they want, legally under the states' laws, or in Colorado from growing it. This needs to be repeated as often as possible: Colorado and Washington's marijuana laws are different from federal marijuana law, but that doesn't mean they conflict with it; and not every conflict is legally impermissible. If federal law just preempted state law in that way, 18 states would not have medical marijuana today. 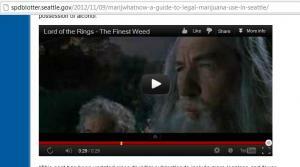 Embedded video from "The Lord of the Rings," appearing on Seattle Police Blotter legal marijuana guide page. You can legally carry up to an ounce of marijuana, as of December 6th, but not in public view. Rules for marijuana stores will be developed over the next year, and won't be done until December 1st, which means no legal sales until then. Marijuana smoking in public is ticketable in some places -- treated like cigarette smoking. Police like the clarity of legalization more than the grey area of Seattle's previous "lowest priority" policy for marijuana enforcement. Police are reviewing their hiring policies with regard to prospective officers' past marijuana use. Police will not assist the federal government in any investigations into marijuana offenses that are legal under state law. Police will not return marijuana they seized from you prior to the passage of the initiative. The article was written with humor, and includes embedded video from The Lord of The Rings movie of Gandalf and Bilbo blowing smoke rings. I almost forgot the main highlight from the bulletin: "You can certainly use marijuana in the privacy of your own home." 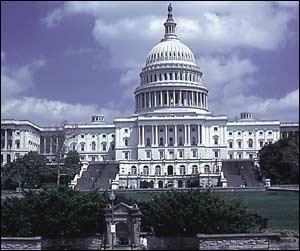 Jacob Sullum has a detailed discussion in Reason's "Hit & Run" blog of "What Legal Pot in Washington Will Look Like." Jacob compares Washington's I-502 with Colorado's Amendment 64 and notes that while both initiatives legalize marijuana for adults 21 or over, and authorize state-licensed marijuana stories, in other (but not all) ways Washington's law is more restrictive than Colorado's. The main differences are that Washington doesn't allow home growing; there is a Driving Under the Influence provision that is tied to a specific THC level (the provision that prompted some objections within reform circles); stores are more regulated; and the tax rate is higher. Conversely, Washington's law does not allow local jurisdictions to ban marijuana stories within their borders, an option that cities in Colorado will have. If you've followed the Medical Marijuana Update series that Phil has been writing in our newsletter, you'll probably agree that that is a big benefit. Unlike Colorado's law, which can only be changed by constitutional amendment, I-502 can be amended by the legislature at any time -- with a 2/3 vote for the next two years, or by majority vote after that. Our friend Roger Goodman, election this week for a fourth term in Washington's House of Representatives, told the Seattle Weekly last month that he and Sen. Jeanne Kohl-Welles hope to address the DUI issue, and improve the state's medical marijuana system, perhaps through requiring that impairment be determined by independent experts rather than the per se DUI standard or other means. Hopefully other changes or expansions to the law will become possible over time too, as voters and legislatures become accustomed to marijuana being legal and are satisfied that things are working. Unlike with medical marijuana, non-patients (over 21) obtaining marijuana will not be an issue anymore in Washington or Colorado. 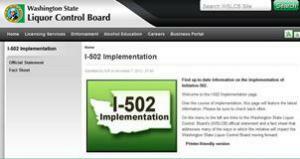 The Washington State Liquor Control Board and the ACLU of Washington have both issued facts sheets on the implementation of I-502. The state's Office of Financial Management projects prices will average about $12 per gram, based on current dispensary prices (via Sirens and Gavels). 502 does not provide for home growing. But patients maintain their home growing rights under the state's medical marijuana law.